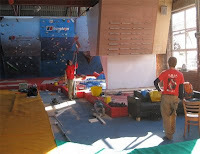 Sam & Percy today went back to work on the new training facilities situated at the Campus board area. Sam and Percy admiring their creation. Most of the campus rungs are back on but it's not fully ready yet. Nearly though. For those who have been worrying about their feet hitting the underside of the board, you need not fret. The lads have lifted the campus board out another 18 inches meaning there is tons of clearance for even the lankiest of people. The other plus is that you can still place your feet on the back wall if you're training PE or want to take some weight off for lock-offs so all good all around. 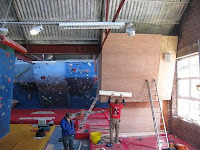 Regarding timescale - 45 will have holds on sometime next week while the campus board will be finished in the next few days.